Barnaby flew into the lives of more than 1.8 million people between 1990 and 2010 flying in the Eagles of Paradise Free Flight Bird Show at Paradise Park in Cornwall, England. 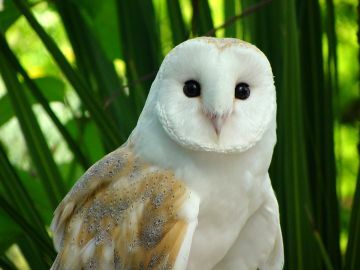 Besides helping to illustrate the silent flight of Barn Owls and their amazing hearing, Barnaby also encouraged people to get involved to help his species in the wild, primarily through the Barn Owl Conservation Network. He also helped train animal care students based at Duchy College in the art of positive reinforcement training and handling and care of raptors. Together with his fellow members of the Paradise Park free flying bird team, Barnaby helped raise awareness of local and global conservation issues. As a consequence, visitors donated more than £140,000 for bird conservation efforts. Barnaby died on 21st of June, 2010 and is buried under the Tree of Heaven at the edge of the picnic lawn where he flew free for over 20 years. After 48 dedicated years, Professor Dr. Claus König is still working with his wife and research partner Ingrid on a long-term study of Eurasian Pygmy Owls. These owls were extirpated from the Black Forest in Germany due to deforestation after World War II, and the Königs reestablished a population from birds raised in captivity after the area was reforested. Professor Dr. Claus König spent much of his career at Staatliches Museum für Naturkunde (Museum of Natural History) in Stuttgart, Germany.He served as the curator of ornithology there for about 30 years, then was named the director, and eventually a professor of bioacoustics and ornithology. König's deep interest in owls has led him to studies in Europe, Africa, and South America. His years of research coupled with his passion for bioacoustics brought him to the realization that owl vocalizations are inherited, not learned, and are thus an important isolating mechanism for species. As a result of his work he has described several new species of owls. Another passion of Claus and Ingrid König is making nature documentaries, often featuring owls. Besides making several films for TV, Professor Dr. König has published over 250 scientific papers, written numerous articles for magazines, and written or co-authored several books. 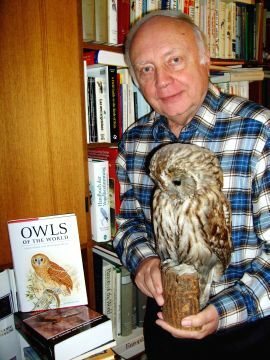 He is probably best known to owl biologists around the world for authoring the "bible" on owls, along with his colleagues Friedhelm Weick and Jan-Hendrik Becking: "Owls—A Guide to the Owls of the World" in 1999, as well as the updated and revised second edition "Owls of the World" in 2008. Working to protect owls in Nepal is an uphill battle. Until Mr. Acharya started his efforts, there was little data on the species that live in the country or their populations. There is illegal hunting and trading of owls, and they are not necessarily regarded with good will. 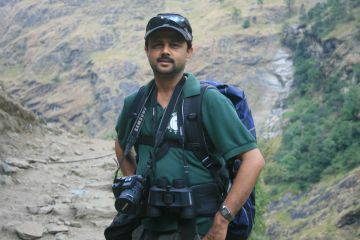 In the short three years that Mr. Acharya has been working to protect owls in Nepal, he has truly made a difference. He led a team of 10 volunteers to conduct ground-breaking surveys of the owls of the country and has interviewed hundreds of people around the country about their knowledge and attitudes about owls. He is currently working to ascertain the extent of the hunting and trade in European Eagle Owls in his country. Spreading knowledge is the key he is using to help owls in Nepal. Mr. Acharya has reached at least four million Nepalese people through radio, television, and newspaper. He has conducted 200 owl conservation awareness programs targeting 5,000 students and other stakeholders and is currently working to produce a field guide to the owls of Nepal. He is helping to form eco-clubs in schools, works to ban killing of owls by catapult, and is stressing the control of forest fires to conserve their forest habitats. Since agriculture is the backbone of the economy, he also is focusing on how beneficial owls are to agriculture.